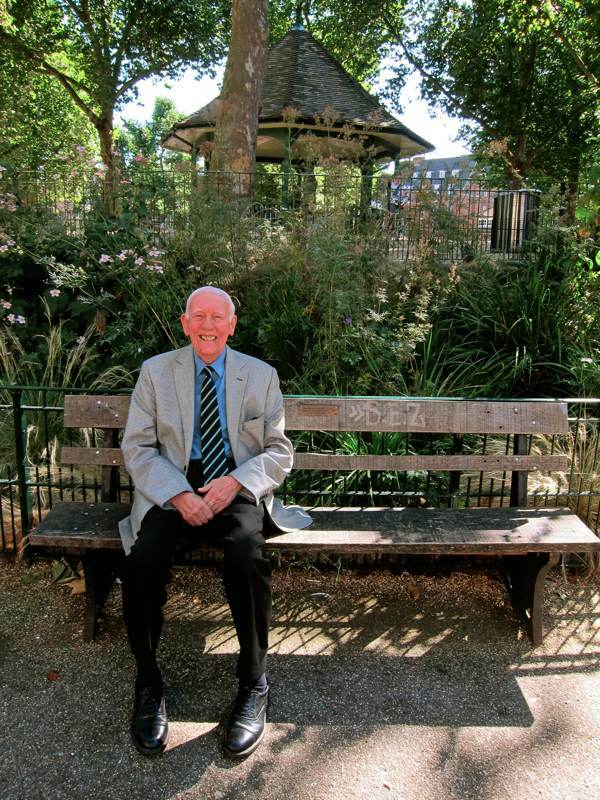 If you were regularly around Arnold Circus on a Sunday morning in recent years, you may very likely have seen Lennie Sanders upon his regular pilgrimage, coming on the 67 bus from Stamford Hill to sit upon the first bench on the left beneath the bandstand, the one donated by the Cambridge & Bethnal Green Boys’ Club. He was born ninety-four years ago in Padbury Court nearby, close to where his wife Annie grew up on the Boundary Estate, and, when they first married, they lived in Cookham Buildings where their son Roy was born. Lennie confided to me that it consoled him – once Annie and Roy were no longer alive – to return to Arnold Circus on Sunday and sit in quiet contemplation of those years which brought him so much happiness. 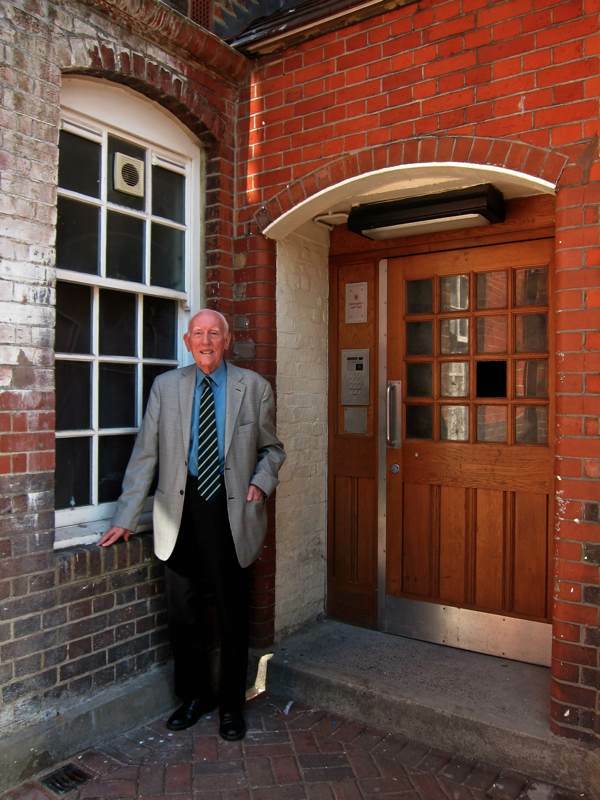 “I’m always happy when I’m here, because I feel as if I am back home.” Lennie continued, regaining his absorption as we turned the corner from Brick Lane into Padbury Court, halting for a moment of devotion at the site of the terrace on the north side where he grew up, demolished half a century ago. Further along, where the road becomes Gibraltar Walk, and passing the old furniture workshops, we came to the junction with the Bethnal Green Rd where the event took place which Lennie considered to be the turning point in his childhood. “To be honest, I never knew my mother because she died when I was eight,” Lennie revealed with a shrug – moving on unexpectedly – and outlining the lengthy rehabilitation that preoccupied his attention in those years. A process compounded by the subsequent discovery that the accident had affected his hearing, which kept Lennie out of school for four years. “When my mother died, my father had a bad heart attack and couldn’t work no more,” Lennie added under his breath, amplifying the nature of the circumstances and lowering his eyelids in regret. As it turned out, Lennie’s rehabilitation encouraged a love of sport and very soon he was leading the boys of the club in nightly runs down to Trafalgar Sq and back. “If they wasn’t very fit, I would let them wait at St Paul’s and join us again on the way back,” he confessed with an indulgent grin, “I was always a very fit boy.” Leaving school, Lennie went to work as one of more than a hundred Western Union messenger boys based in Great Winchester St in the City of London, which further exercised his athletic ability. “Mostly we delivered round the Stock Exchange, but sometimes we had to cycle to Shepherd’s Bush,” he recalled gleefully. In fact, Lennie played football and cricket at professional level for Clapton Orient, the club that became Leyton Orient. “My doctor kept going on about having my arm straightened, but I refused – I never made it a handicap.” he confirmed. Much to Lennie’s regret, his poor hearing prevented him joining the Navy when the War came along and so, unable to enlist, he worked as glazier and then in demolition upon bomb sites, staying in London throughout the blitz. Memorably, he took his wife-to-be Annie Hiller up to the West End to see a film only to return to Shoreditch to discover an unexploded bomb was stuck in the chimney of the wash house on the Boundary Estate. “Annie couldn’t go home, so I took her back to Princes Court to meet my father for the first time,” Lennie confessed. In 1942, they were married and moved into Cookham Buildings where their son Roy was born two years later. “I started cab-driving in 1946. My brother-in-law said ‘You already have the Knowledge from when you were a messenger boy.’ When I began, the cab was open, so you had to wear a hat and a big coat in winter. I did it for fifty-five years until I retired in 2000.” Lennie told me. 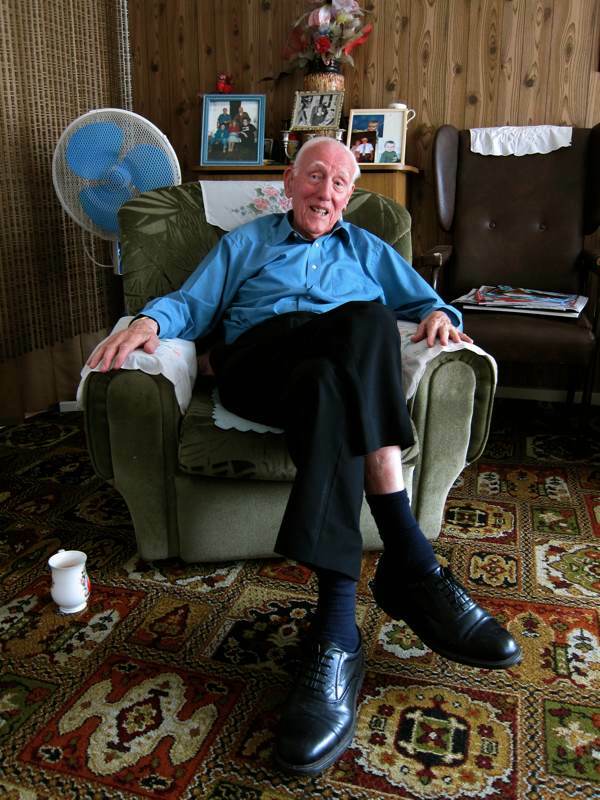 It was in 1951, when Roy was ten, that the family moved to a two bedroom flat in Stamford Hill, where Lennie lived alone after Roy left home and Annie died, yet where seventy people attended his ninetieth birthday party. Throughout our walk, Lennie cradled a bag of two cheese beigels which he had bought that morning in Brick Lane. Completing his story, he revealed that an old friend had recognised him in the crowd and called out to him, a recurring event on those Sunday visits to the market. “I get off the bus at Shoreditch High St, and I walk through Brick Lane and then back up towards Bethnal Green, and I go down my street, Padbury Court,” he recounted – as much to himself as to me – recapping our journey that morning. 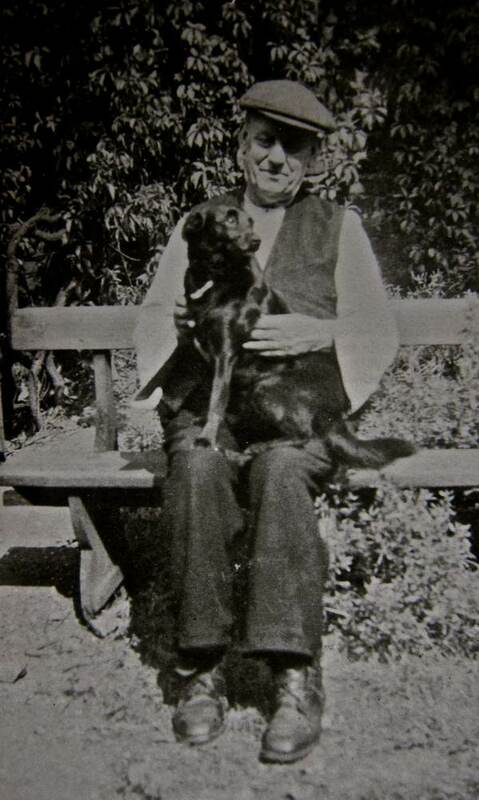 Lennie’s father Basil (he called himself George) with his dog Nobby in the garden of 7 Padbury Court. 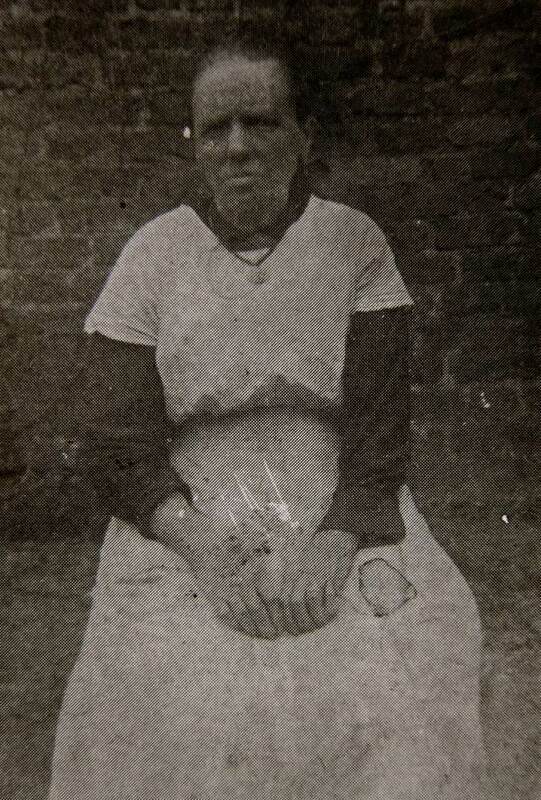 Lennie’s mother Ellen wore an apron of sacking but put on a white one for this picture. 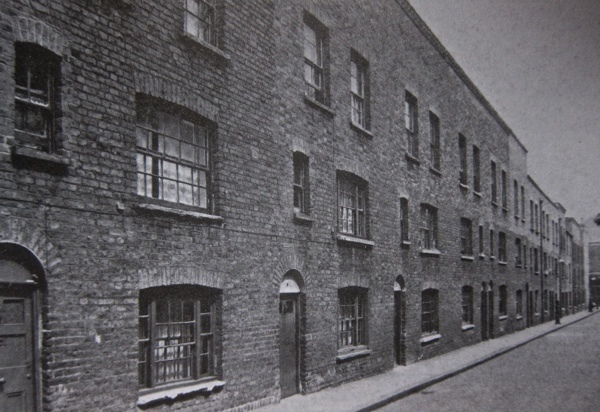 The north side of Padbury Court (known as Princes Court then) where Lennie was born in 1922. Lennie in Padbury Court – the northern side was demolished over fifty years ago. 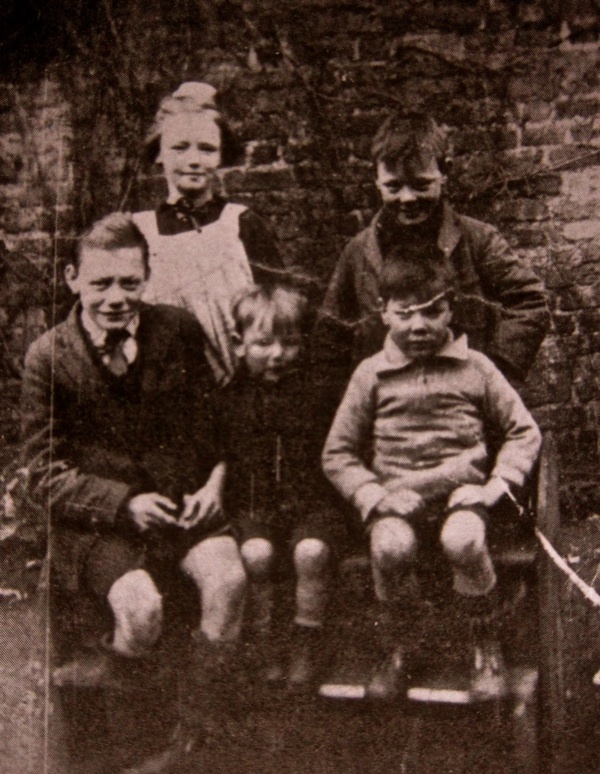 Lennie was the youngest, here aged four in 1926 photographed with (clockwise) Bunny, Eddie, George & Jess in the back garden of 7 Princes Court. 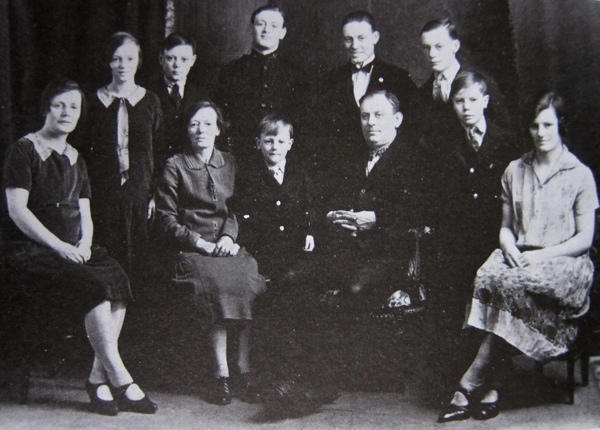 The family in 1928, Lennie stands at the centre aged six. 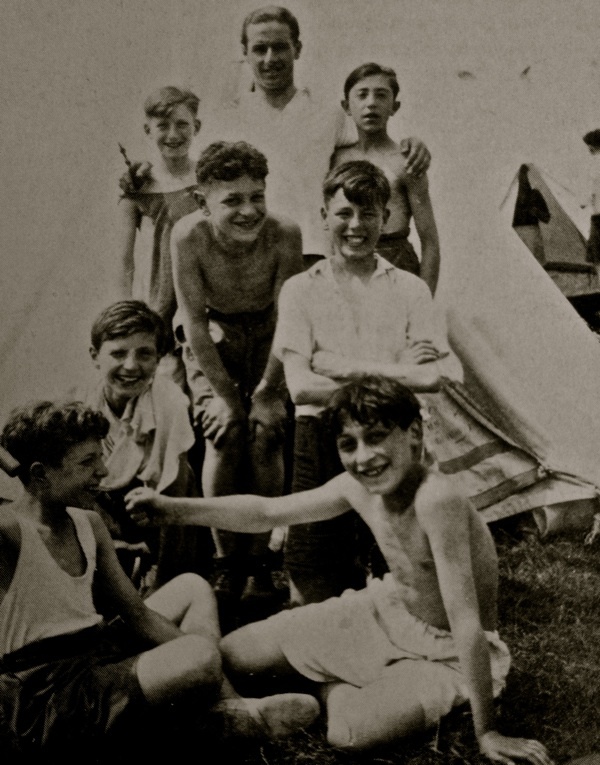 Lennie (in the white shirt) camping with the Cambridge & Bethnal Green Boys’ Club, 1936. 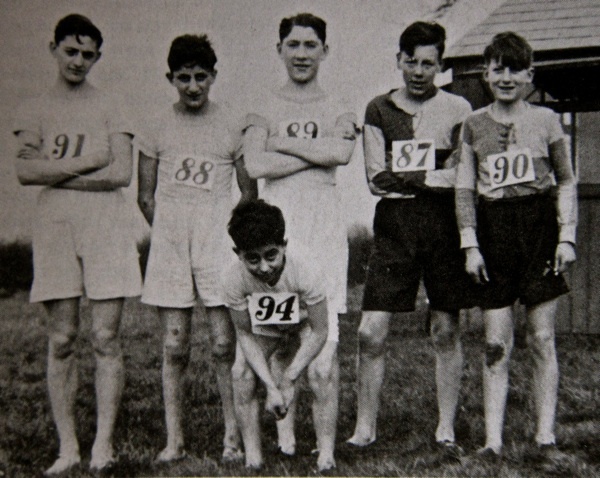 Lenny is number 87 in the club cross-country team. Lennie at Cookham Buildings where he lived when he was first married and his son Roy was born. 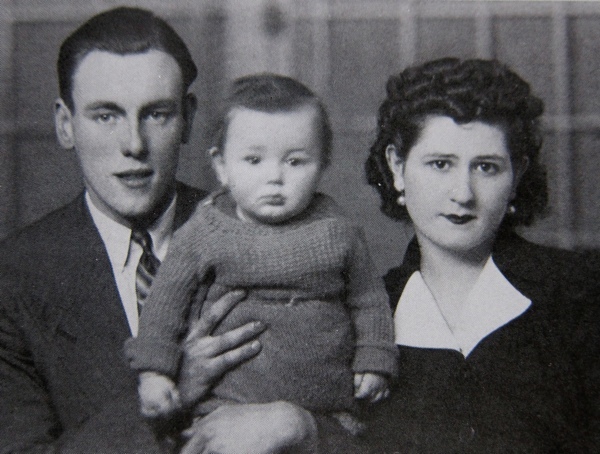 Lennie and Annie with their son Roy in 1944. Yet another of your truly lovely portrayals – thank you. Rest in peace, Mr. Saunders. 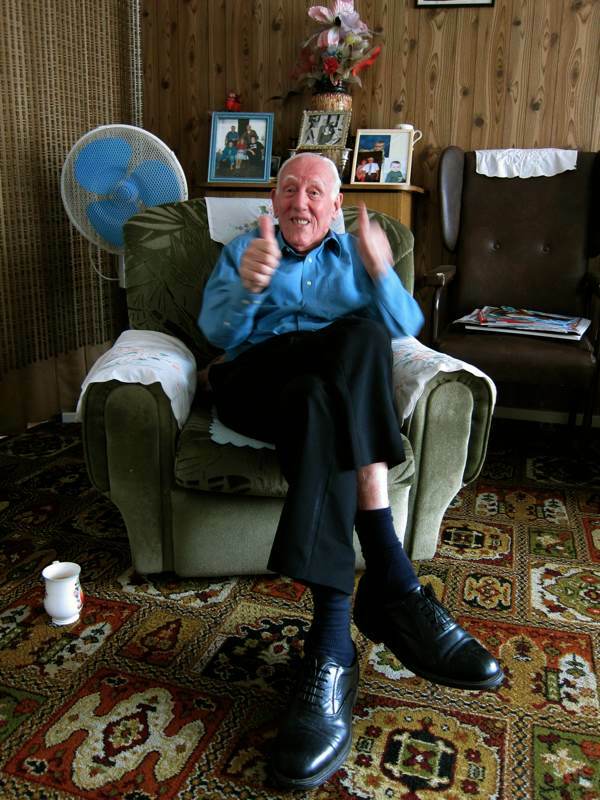 A truly wonderful tribute, that not only captures the spirit and personality of Lennie for those of us who were not privileged to know him, but sums up all that is best about this blog. The Gentle Author somehow manages to encapsulate all that is best and worst about humanity in thought-provoking, clear and sympathetic language. Would loved to have taken a journey with Lennie as the cabbie! Bless his wonderful heart……. Mr Lennie Saunders — R.I.P. forever! What a gentleman of memory and neighbourhood history. His routine, including the two cheese bagels, makes us realize how the past is never too far away. Many, many thanks Gentle Author for taking the time to pay this tribute. The Cambridge & Bethnal Green Boy’s Club will forever be in your debt for preserving these wonderful stories and images of childhood in our city. Long may you reign ! In a celebrity obsessed world, your celebration of ordinary people provides a necessary and beautiful contrast. There is such a sense of a real life lived and a touching and dignified sense of loss and personal veneration of the past here. Your portraits of ‘ordinary’ people contain the genus for so many novels or short stories. But these lives ate not fiction, just the stuff of it. I wonder how many actual or would be novelists are inspired by your blog? Thank you, I enjoyed reading about this man who I will never meet. RIP Lennie. Beautifully written and with evocative photographs. I am currently reading ‘Shadows of the Workhouse’ by Jennifer Worth. It’s the first book I have read by her, her writings inspired the Call the Midwife series, which I did watch. Another fine story of real life and the good and bad times that go to make it. I greatly appreciate this story. A warm and touching tribute. A big thanks for the tribute and those that commented. My granddad was an extraordinary ordinary man. He continued these weekly trips right up until December of last year. The bandstand and east end were his favourite places to visit. 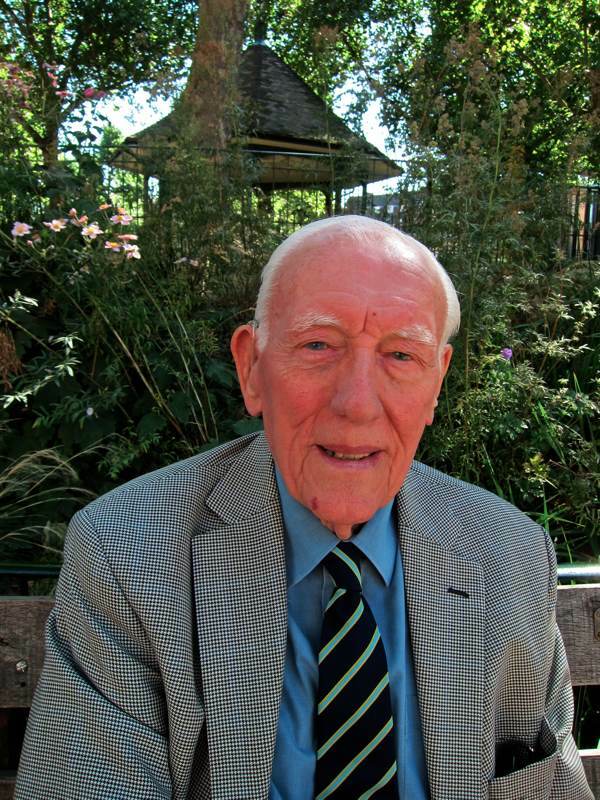 I Grew up in swanfield St Bethnal Green opposite lenny’s beloved bandstand and was a member of the New Cambridge boys club from 1984 -1988 My Dad Alfie Hayes, who was the Branch chairman of the 1/511 T .G.W.U. 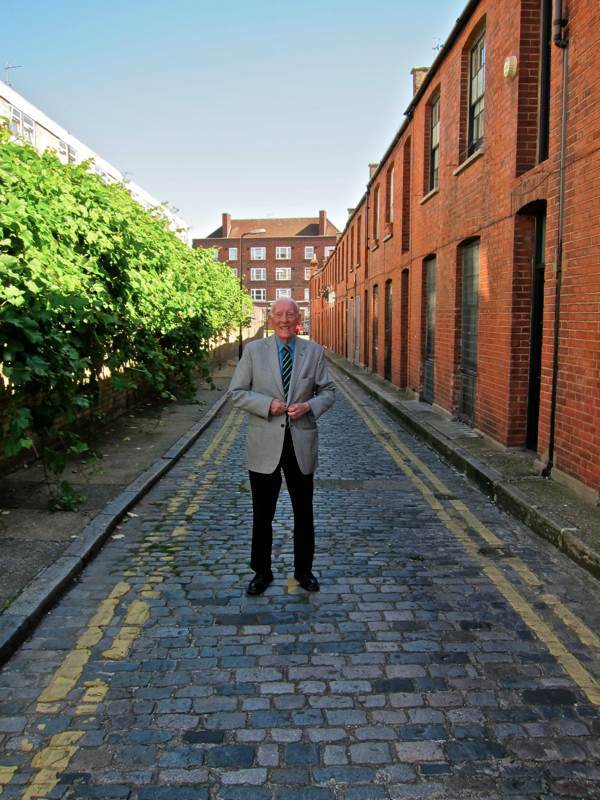 Which consisted of over 400 licensed spitalfields market porters was a friend of Lenny Saunders and my mum tells me that he and his wife Annie would sometimes pop round to our flat 16 lamb St above spitalfields market in the 1970′s when I was only a baby and I remember Lenny taking badminton classes on a Tuesday night at the Cambridge the other memory of Lenny that I have is of his association with Tottenham Hotspur football club , I believe he was a scout their in the 70′s he definitely accompanied the boys from the new Cambridge club on a tour of White hart lane when such things were uncommon and he was also instrumental in getting footballers such as Spurs player and 1st 1million pound teenager Clive Allen , Man Utd Goalkeeper and ex new Cambridge boy Les Sealy to attended the clubs annual presentation days, He also managed to get hold of four tickets to the 1984 UEFA cup final for my Dad my uncle ,brother and myself , in fact so legendary was his ability to obtain big match tickets that amongst ex Cambridge boys who still go over spurs it’s a running joke when we are struggling for tickets to a big spurs match that someone will inevetibley say to me “Any chance Lenny Saunders can get hold of a couple” Rip Len from John Hayes and family and all other ex New Cambridge boys Cheers!!! R.I.P. Uncle Lennie a true East End Gentleman so proud and lucky to have had you in my life every piece of advice you game was a gem. 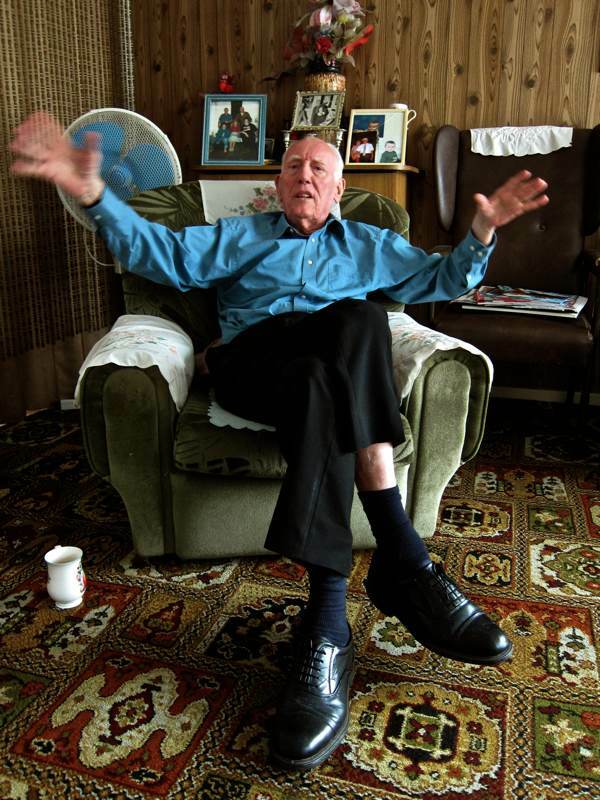 I am so very sad to read of the death of Lennie Saunders I grew up on the Council Estate on Stamford Hill. We lived in Sidlaw House. Lennie lived in Quantock House next door. My dad was a cab driver too and he know Lennie very well. I knew Roy from the Estate and at Stamford Hill Club.